Shria Akalamkam, Secretary of Arcadia High’s Unity Through Poetry, presenting during a club meeting. Walking through the halls at lunch, students at Arcadia High School pass various clubs with specific objectives for the student body. 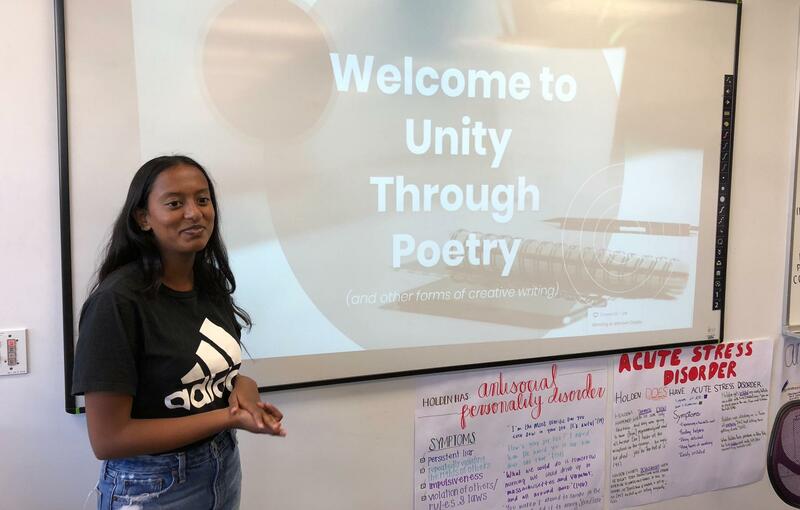 Of the new clubs granted charters this year, right after being given the green light, Arcadia High’s Unity Through Poetry club has already made a profound impact on students. Club members gather every Tuesday to connect and discover the various ways poetry can be used as a conduit to self-discovery. Throughout the year, the club will dissect and analyze various forms of past and modern poetry through interactive events, club activities, and discussions. For example, they will analyze Maya Angelou’s “Still I Rise” which was written 30 years ago, but the message and significance of the poem continue to resonate with modern society. In addition, they will be discussing more modern pieces, such as spoken word poet Jericho Brown’s “Bullet Holes” which discusses poverty, police brutality, and racism. Unity Through Poetry aims to unite the student body by creating a safe haven to have meaningful discussions on progressive topics present in creative literature. It strives to help young adults understand the hardships and struggles present in the world and empowers them to bring about reform through poetry. The club also curates a list of writing contests where students can submit their work in the hopes of winning scholarships, awards, and other forms of recognition. Club officers plan on helping prepare members for each of these competitions by providing them the tools necessary to excel. To ensure that their members have a place to showcase their poetry, the club is working on creating a magazine or website where students can become published poets.